The classic four-in-hand knot is one of the most popular necktie knots. It suits almost all types of shirt collars and ties, unlike the Windsor knot that pairs well with spread collar dress shirts or the half Windsor that goes well with ties made out of thick fabric. It is mildly asymmetrical, tapered and slender. Etymologically, it came into limelight after becoming a fashion statement among the members of a 19th-century gentlemen’s club in London of the same name. It is one of the 3 prescribed tie knots for the US army and navy uniforms. 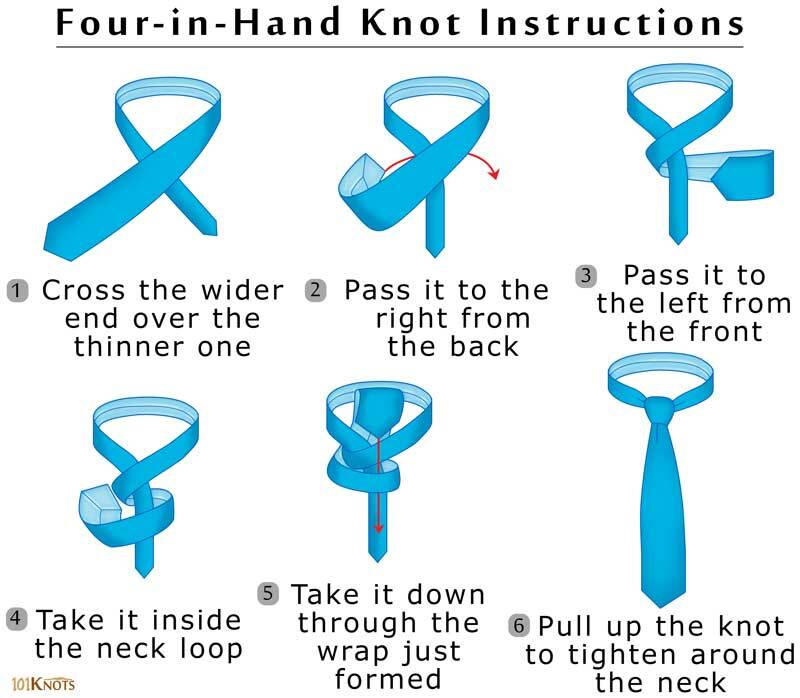 While doing the last step, create a dimple just below the knot with your hands to give it a touch of class. You can wear it to casual occasions like social outings and parties on a par with formal ones like interviews and business meetings. Appropriate for weddings along with the full Windsor knot. Skinny, medium length ties are perfect for it. Though it matches button down collar dress shirts and narrow spread collars best but ok with cutaway and round collars. 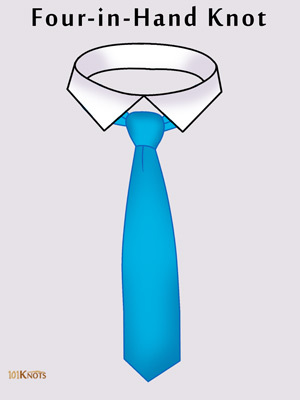 Double four-in-hand knot – The broad end is wrapped around twice instead of once and brought down through both the wraps. Onassis knot – Excepting the last few steps all the others remain the same as the four-in-hand tutorial.